...On a hill just above Bradford Street, this secluded, peaceful oasis in the Gallery District is just a ten minute stroll from the high energy of the center of town. 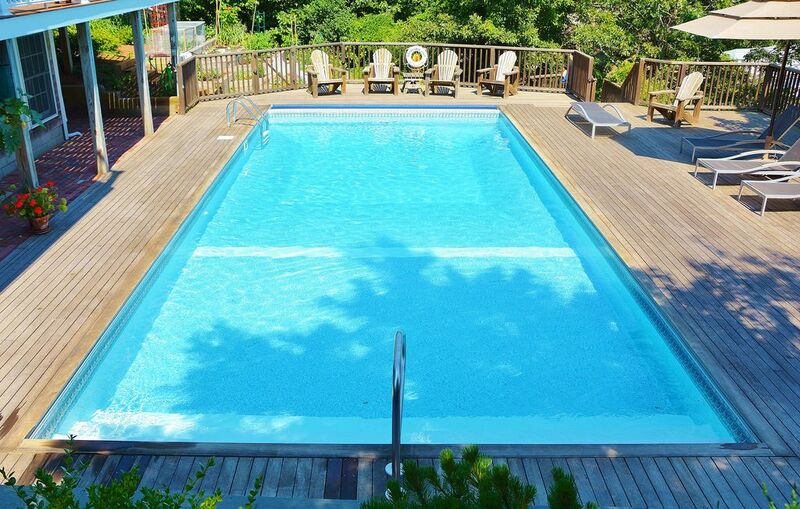 The large (40' x 16') heated pool is perfect for swimming laps or just relaxing. It's open mid-May through late October and is kept warm enough for a cool Ptown evening swim. The split-bedroom layout, both with queen size beds and large flat screen HD TVs, insures plenty of privacy. Inside is 1250 square feet of living space all on one floor, and the 800 square foot private deck has a lounge area on the west side and covered dining area & gas grill on the east side. We built an open gourmet kitchen with top of the line stainless steel appliances and pietra cardosa counters to flow seamlessly into the living/dining room. With its lofted, beamed ceiling and wrapped in full-length windows, you are bathed in sunlight creating a truly special, sweeping openness. Double French doors step out onto the private mahogany deck which sits above the pool area, surrounded by landscaped gardens and lush trees. We have tried to keep its Provincetown character and charm by restoring the beautiful, original wood floors of this 1950's home and relighting the sunken den which is the perfect, cozy spot for reading under the skylight or relaxing in front of the fireplace. We have also added modern upgrades including a 65' LED Smart TV with stereo sound bar & Smart Blu-Ray DVD for music and movies, a high-speed wi-fi network, a network printer/scanner if you need to keep up with work, and air conditioning/heating throughout. The master bedroom has an en suite tiled bathroom with a deep soaking tub/shower, Toto Washlet toilet, and Miele vented washer/dryer. There is also parking for one car. The East End Market is a wonderful grocery market/deli/liquor store just steps away on the corner, and they have most any last minute items you may have forgotten, from toiletries to aspirin to sunscreen. VERY IMPORTANT: The state of Mass/Provincetown has imposed a rental tax of 14.45% on all short term rentals. The tax went into effect on January 1, 2019. Any lease signed on or after this date for a rental term beginning July 1, 2019, or later must include the rental tax. JULY 4TH RENTAL WEEK WILL NOT BE TAXED! ALSO, ANY RENTAL PRIOR TO JULY WILL NOT BE TAXED AND YOUR FINAL COST WILL BE ADJUSTED ON THE WEBSITE! Both Bathrooms have been totally renovated. The en suite Master Bathroom has a deep soaking tub/shower. The Second Bathroom has a large walk-in shower. Should you have any problems or questions about the property while you are there, please don't hesitate to call our property manager, Lisa. She is always very helpful. NO ADDITIONAL CLEANING FEE. Note: 2019 Summer Premium Theme weeks: $4,200. Heated Pool open mid May-mid October (through Women's Week).